The BugLady encountered a deer tick on her scalp last week (second week of March), a reminder that these are very hardy little critters—and—that the uncharacteristically balmy weather is getting lots of stuff going early. So, here’s the deer tick story as told in a BOTW from three years ago along with some hot-off-the-presses additional information and, of course, new pictures. 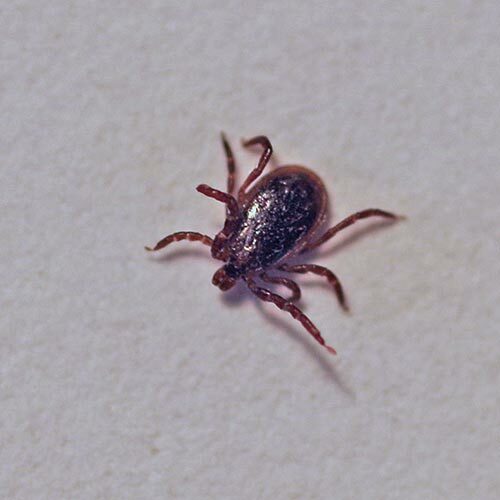 The Deer Tick (Ixodes scapularis) (not to be confused with the musical group Deer Tick) is a critter whose escapades are well known to those of us who live here in God’s Country (at least they should be). It’s notorious for its ability to spread Lyme (not Lymes) disease and because its sesame-seed-size makes “tick checks” a challenge (scroll down to the ruler). Lyme disease is an initially-flu-like disease that doesn’t go away and will escalate if ignored, and it is more treatable early than late. The CDC has a very comprehensive website with information about tests, symptoms, treatment, and prevention at CDC – Lyme Disease, (there’s disagreement about Lyme disease testing and treatment, mainly from organizations whose members have spent months and years looking for a clear diagnosis and an effective cure for this frustrating disease). Lyme disease is not “catching,” and you can’t get it from eating venison from an infected deer (but kneeling on the ground dressing out a deer puts you right down there in DT territory). 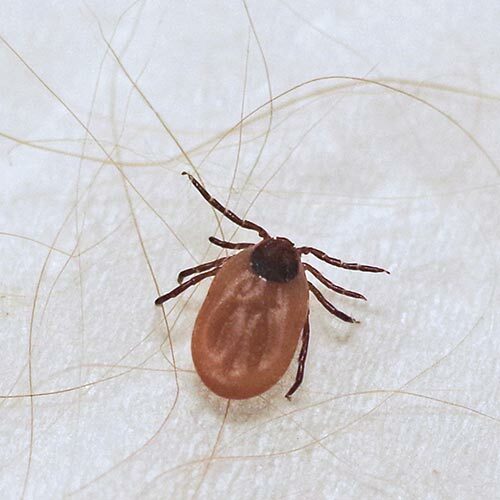 When the BugLady moved into her rural home 39 years ago, ticks were scarce, she plucked a wood/dog tick (Dermacentor variabilis) off the dog every 5 years or so, and she never saw a deer tick. In the past four or five years she has seen fewer wood ticks, but deer ticks (a.k.a. Black-legged ticks) have arrived in force and are showing their little heads by late April (chiggers are way more numerous, too). An article in Science Daily (June 22, 2011) refers to the “steady march of deer ticks across the Upper Midwest” and reports that the rate of their advance through Indiana and Illinois (having successfully occupied Minnesota and Wisconsin) is two counties per year. Non-feeding adult DTs are very small (about 3mm long) and flat and dark (females may look blood-red when they’re empty but not when they’re full), with eight black legs and a black “shield” (called a scutum) in back of its head. DTs don’t have any white/light markings on the scutum, but wood ticks do. A feeding adult female looks like a tiny, over-filled, blue-gray balloon (“as tight as a tick”) (the BugLady is trying to avoid comparisons to grapes here, lest she put BugFans off their feed). DTs lead a complex, three-stage, two-year life. All three stages are mobile and all three require a blood meal that can take three to five days to complete. Adult DTs are fairly impervious to frosts and can be out and about on winter days that are above freezing. In spring, Mom has a big meal (adult males rarely feed), mates, drops to the ground, and lays thousands of eggs. The first post-egg stage is a minute’ six-legged larva that feeds once during mid-summer on a bird or a small mammal (it’s especially fond of white-footed mice). The well-fed larva leaves its host and overwinters in the leaf litter. The following spring it molts into a poppy seed-sized nymph that feeds again (another mouse, maybe, or a raccoon or squirrel) and then molts into an adult that becomes active in fall. Adults favor large mammals like white-tailed deer. Ms. DT finds Mr. DT through the magic of aggregation pheromones (chemical perfumes) that cause DTs to gather in groups, allowing boy to meet girl. They may mate on a host, on vegetation, or on the ground. He dies after mating a few times; she dies after laying eggs. Where does a DT pick up Lyme disease? Typically not from Mom, even if she’s carrying it. An uninfected larva or nymph can pick up the disease from its host; an infected larva can transmit it to its host, and once they’ve picked up the infection, ticks retain it for the rest of their lives. The general estimate is that in high-Lyme areas, 25% of nymphal DTs and 50% of adults carry the bacterium that causes the disease, but according to the American Lyme Foundation, fewer than 5% of DTs south of Maryland are carriers. 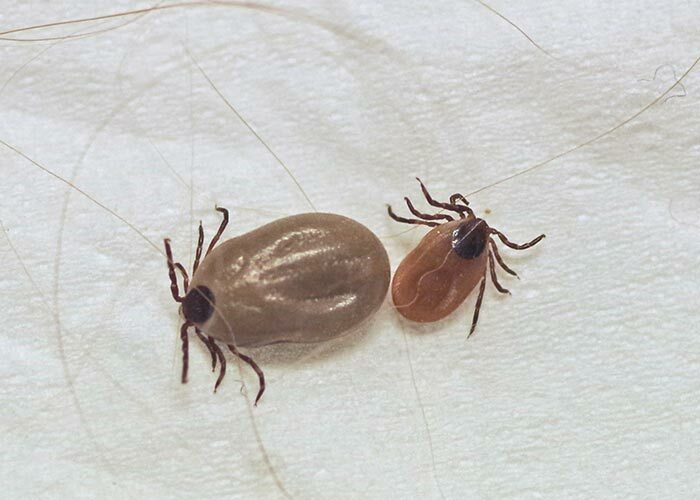 Dog ticks do not spread Lyme disease (but they are not totally innocent bystanders, either). DTs are classed as sanguivores (animals that ingest fresh blood). They’re opportunistic—to find a host, they’ll often wait at the tips of vegetation in what is called the “questing position,” sensing the air, waiting for something large to brush against them (top picture then scroll down for a Lyme map—we no longer presume that someone who tests positive for Lyme has been “up North”). The biggest mortality factor for ticks may be starvation, and harsh climate can also affect them. The BugLady originally quoted one source that said “They typically aren’t eaten by predators because they’re simply too small to see,” but alert BugFan Laura points out that a whole bunch of predators, from shrews and birds to nematodes and soil fungi, have been known to partake (engorged ticks must be a lot easier for larger predators to find). BugFans keep the BugLady honest. Here’s the DT’s pedigree: they’re in the family Ixodidae (the hard ticks), which is in the order Ixodida (ticks), which is in the class Arachnida (spiders and friends), which is in the phylum Arthropoda (insects, spiders and crustaceans). They are, potentially, found wherever their final host, the white-tailed deer, is found. Most DTs live east of a line from Minnesota to Texas. Along with Lyme disease, DTs can pack a number of disease-causing bacteria and parasites into that tiny body, and scientists are still finding new ones. In the three years since the original DT post, a West Nile virus/meningitis-like disease called Powassan virus has been added to the deer ticks’ arsenal. Tiny nymphal ticks far outnumber their elders, and because nymphal ticks are most active during the period when we’re all outside in summer, bites from nymphal ticks are presumed to be the cause of most human infections. Pets can get Lyme disease, too; talk to your vet. In eastern oak forests, a big load of acorns (a “mast year”) results, for the next few years, in lots of white-footed mice and deer, which means fewer gypsy moths (mice eat their pupae) and more hosts for the DTs. More DTs mean more Lyme disease. Fewer acorns mean fewer mice, more gypsy moth outbreaks, and less Lyme disease. The incidence of Lyme disease is linked to the presence of deer, but it also reflects the population cycles of certain small mammals. A decrease in predators like the red fox (coyotes have taken over) results in larger populations of potential tick hosts like mice and chipmunks and more Lyme disease (remember, though deer are important in the DT’s end game, most people probably get infected by a DT nymph, which hasn’t met a deer yet). Deer ticks like white-footed mice, and white-footed mice like woodlands. Research in Illinois shows that DTs are gaining a foothold in Illinois prairies by setting their sights on prairie voles instead. 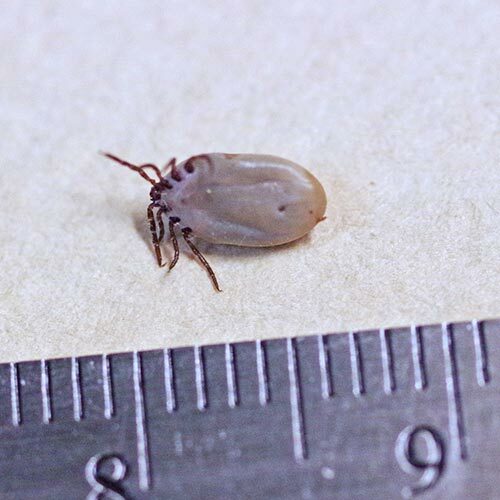 Also new on the Wisconsin scene is a new tick species, the Lone Star tick, which carries its own set of unpleasant diseases, including one that may trigger in the “bitee” a lifelong allergy to beef, pork, and lamb. So—stay inside until winter? Through winter? Nope. Standard precautions include wearing light-colored clothing, using repellants containing DEET, and pulling socks over your pants cuffs to make it harder for ticks to duck and hide. 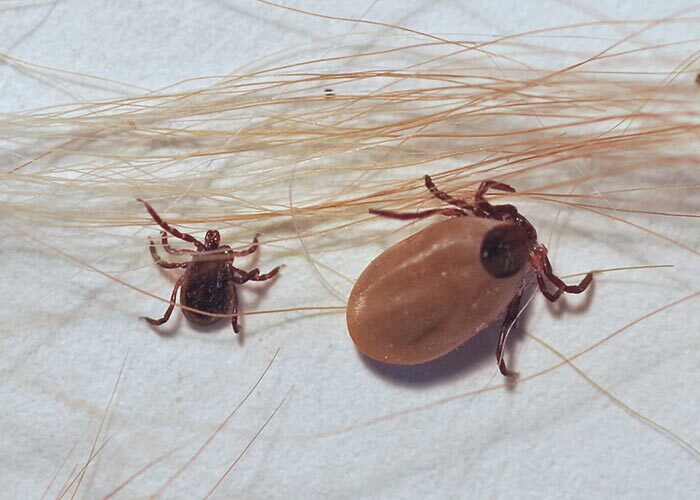 According to the CDC, “In most cases, the tick must be attached for 36-48 hours or more before the Lyme disease bacterium can be transmitted,” so do thorough tick checks of your hairline and all your nooks and crannies.